I feasted on Antonio de Jerez's tortilla all week. I had three pieces when it was still warm. That next morning I reached into the fridge and ate it cold, con mucho gusto. I brought a large piece to my neighbor Tamlyn, who often brings me portions of her delicious and soul-satisfying soups and ragoux and who I knew would appreciate this delight. I fed off that beautiful tortilla for several days, until there was nothing left but a few crumbs. And I ate those, too. And then it was gone. I stared at the empty plate and felt...alone. Insecure. I had the same kind of general sinking feeling I get when I drink the last of my Two Buck Chuck. "Oh no. It's gone. Now what am I going to do?" Then my daughter started putting the pressure on for me to get her some Pop Tarts. Not Trader Joe brand pop tarts, but the real stuff, in all their chemical preservative goodness. I was hungry. I wanted tortilla. Then I had a brainstorm. If I'm at Ralph's, I thought, I can just get the ingredients for tortilla and give it another try. It's easy, right? It won't take long. I can make my own tortilla and eat it tonight! So the girl got her Pop Tarts (S'more Pop Tarts...igg!) and I procured the necessary items to try, once again, my own tortilla. Thanks to the thoughtful and very good-looking Tony Triana for the list. To be safe, I replicated even the brand names. I peeled and chopped one medium potato, which was much smaller than the russet potato I used on my first attempt, so I added a second, smaller potato. I fried these up gently in my cast iron skillet, stirring often so they wouldn't stick. I didn't want to let them brown either, just soften. I added just the tiniest big of chopped onion. I whisked five eggs in a glass measuring cup, added salt and black pepper. I chopped up about a fourth of a cup of parsely. I found a pan I felt sure would mold the tortilla into a pleasing shape, and I oiled it up well. I drained the extra oil from the potatoes, and transferred them to this new pan. I added the eggs and the the parsley. I watched. I jostled the pan so it wouldn't stick. I used my spatula to loosen the sides. When I felt it was firm enough, I put a plate over the top and flipped the whole thing so that I could cook the other side. And here's where it all went to hell. Most of it stuck to my pan. The part that didn't both crumbled and dripped onto the plate. With no form left, there was nothing to do but scrape it all back into the pan and cook it up. That's when I realized my many mistakes. - I don't have any sense of proportion. My potato-to-egg ratio was embarrassingly off, to significantly worse results than last time. - Wayyyyyyy too much parsely. - structural problems. It stuck to my pan, even though I oiled it and kept it all moving and the result was gloppy chaos. There are some foods that simply must meet a basic aesthetic standard and a Spanish tortilla is one of them. Antonio's was round and firm, like a cake almost. It's pleasing to look at. You can't wait to cut into it. I'm still very far from my goal. I have the ingredients, but only the vaguest idea of how to combine them properly. The results of this round: Crap. 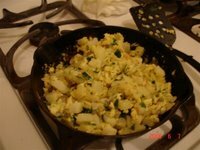 A potatoe stir-fry with some egg and some parsely. Thanks for the recipe, I think. Now I can make potato-parsely stir-fry! HEY! A little consideration please - I'm starvin' here!! !